Special Counsel Robert Mueller has indicated to lawyers for President Donald Trump that his office will seek answers directly from the president on the circumstances around the firings of former national security adviser Michael Flynn and former FBI Director James Comey, sources with knowledge of the matter confirm to ABC News. For the last several weeks, the president’s lawyers have been researching and crafting arguments on how to respond to an expected formal request from Mueller to interview the president. As ABC News reported earlier this month, options the president’s legal team have discussed include providing written responses in the form of a questionnaire or some type of in-person interview, according to a source with direct knowledge of the matter. “We’ll see what happens,” Trump said. Trump’s legal team declined to comment when reached by ABC. Earlier Tuesday, a Justice Department spokesperson confirmed to ABC News that Attorney General Jeff Sessions had met for several hours last week with Mueller’s investigators. It’s unclear where the interview took place. Mueller’s team is looking into whether President Trump or anyone else sought to obstruct a federal inquiry into connections between Trump’s presidential campaign and Russian operatives, according to a source told about Mueller’s request for Justice Department emails pertaining to Comey’s firing. The Sessions interview with Mueller comes nearly three months after the special counsel directed the broader Justice Department to turn over a wide array of documents related to the probe. In particular, Mueller’s investigators were keen to obtain emails related to the firing of FBI Director James Comey and Sessions’ earlier decision to recuse himself from the entire matter, ABC News was told by the source informed about the request at the time. Trump told reporters Tuesday that he was “not at all” concerned about the Sessions interview. Meanwhile, Democrats on Capitol Hill have hammered Sessions for denying contacts with Russian officials and telling Congress — under oath — in an Oct. 18 hearing when asked by then-Sen. Al Franken, that he was not aware of nor did he believe any Trump campaign surrogate ever communicated with Russian operatives or intermediaries. But Sessions has since acknowledged meeting with then-Russian ambassador Sergey Kislyak during the campaign. And in the first known charges brought by Mueller, announced in October, former campaign adviser George Papadopoulos admitted he told Sessions and Trump during a 2016 meeting that he was working with Russians to orchestrate a meeting between Trump and Russian President Vladimir Putin. Some Democrats accused Sessions of lying to lawmakers, though he has vehemently denied the charge, citing a memory lapse due in part by the “chaos” of the campaign. At a House Judiciary committee hearing last November Sessions vigorously disputed that he has ever been intentionally deceptive with Congress or the public when it comes to his Russia related dealings. “I will not accept, and reject, accusations that I have ever lied,” Sessions said then. Sessions told lawmakers he now remembers dismissing Papadopoulos’ proposal during the meeting last year. Papadopoulos has pleaded guilty to charges of lying to the FBI about his contacts with Russian nationals. Sessions and Deputy Attorney General Rod Rosenstein played key roles in Comey’s removal. And Sessions has since faced withering criticism from Trump over his recusal and Rosenstein’s subsequent appointment of Mueller. Rosenstein was interviewed by Mueller last summer, and he still maintains final supervision over the Mueller probe. 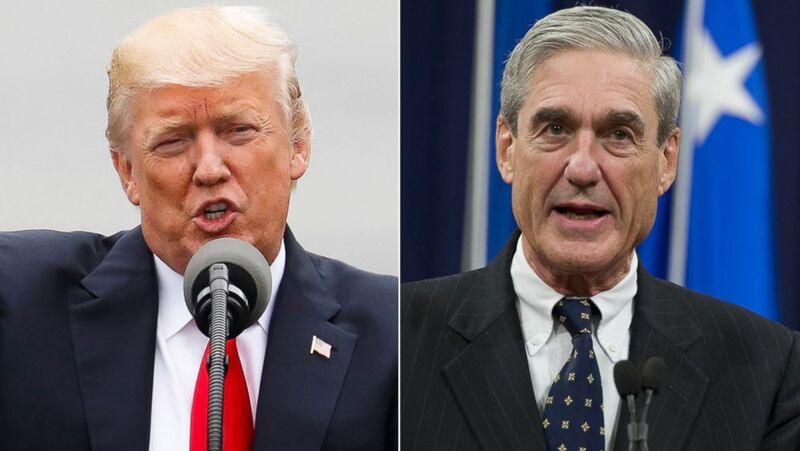 Pictured (L-R) are President Donald Trump in Cincinnati, June 7, 2017 and Robert Mueller in Washington, D.C., Aug. 1, 2013. Trump has openly expressed disdain for the federal investigation, and since his days on the campaign trail, he has questioned the U.S. intelligence community’s unanimous conclusion that Russia tried to meddle in the 2016 presidential election. To publicly bolster Trump’s decision on Comey, the White House last May released two memos written separately by Sessions and Rosenstein, with both faulting Comey for his handling of the FBI’s probe into Hillary Clinton‘s use of a private email server when she was secretary of state. Meanwhile, Trump has taken aim at Sessions for the recusal, launching such biting personal attacks months ago that it appeared that Sessions would not last the summer as attorney general. At one point, Trump told reporters he wouldn’t have nominated Sessions to run the Justice Department had he known Sessions would give up oversight of the investigation. A spokesman for Mueller declined to comment about Sessions’ interview, which was first reported by The New York Times. ABC News’ Mike Levine contributed to this report.